KABUL, Afghanistan (CNN) -- An Afghan militant group is willing to "help" U.S. and coalition forces, if they prepare to leave Afghanistan, the group's leader said in a statement given to CNN on Monday. Afghan warlord and former prime minister Gulbuddin Hekmatyar is wanted by the Pentagon. "We are ready to help with the United States and ... other coalition forces if foreign troops announce the time frame for the pulling out their troops from Afghanistan," said Gulbuddin Hekmatyar, a former Afghan prime minister and leader of the pro-Taliban Hizb-e-Islami militant group. "I am sure Afghans will fight U.S. forces and will continue Jihad against them like they fought against Russia before if they don't leave the country," he added. The former Soviet Union, which included Russia, invaded Afghanistan in late 1979 and fought there until 1989. Because of the extended conflict, it has been referred to as the Soviet's Vietnam. Hekmatyar did not define what he meant by "help," but is typically understood to mean that the group would stop attacks against coalition forces, stop recruiting members and stop the intimidation of local citizens. 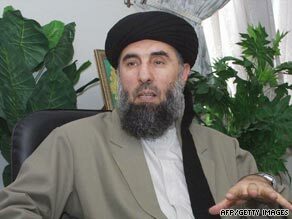 A maverick militant, Hekmatyar is regarded by the Pentagon as one of the top military players in Afghanistan. Ironically, he was the the beneficiary of $600 million U.S. aid during the Afghan war against the Soviets. The militant offer comes in the midst of U.S. and British offensives launched against Taliban militants in Helmand province in the south. More than 13,000 members of NATO's International Security Assistance Force are fighting in Helmand, including 6,900 from the United States, 6,200 from the United Kingdom and several hundred from Denmark and Estonia. Afghan National Army forces are also taking part. The forces are trying to gain and hold ground in the perilous region ahead of national elections this month. The Islamic fundamentalist Taliban ruled most of Afghanistan before its allies in the al Qaeda terrorist network attacked New York and Washington on September 11, 2001. Though quickly toppled after the attacks, its leaders escaped and the movement regrouped in the Afghan countryside and across the border in Pakistan. The Obama administration has moved about 21,000 U.S. troops to Afghanistan as it has shifted focus from Iraq.